Sometimes you feel pretty, sometimes you feel old, sometimes you feel pretty old - especially when falling from a full speed run down the road, skidding across the blacktop, scraping shoulder, hip, and knee. It's rib-cracking good fun, I tell ya (from 2-day-ago experience!) I just thank my lucky stars for a really WIDE elastic wrap around my rib cage. Actually, I read a paper in one of my college classes that said crones are wise. Crones are strong. Crones should be revered. So bring me chocolate and a pillow to put my feet up on, and I'll tell everyone what to do! What do you think of crones? You asked for it, you got it! 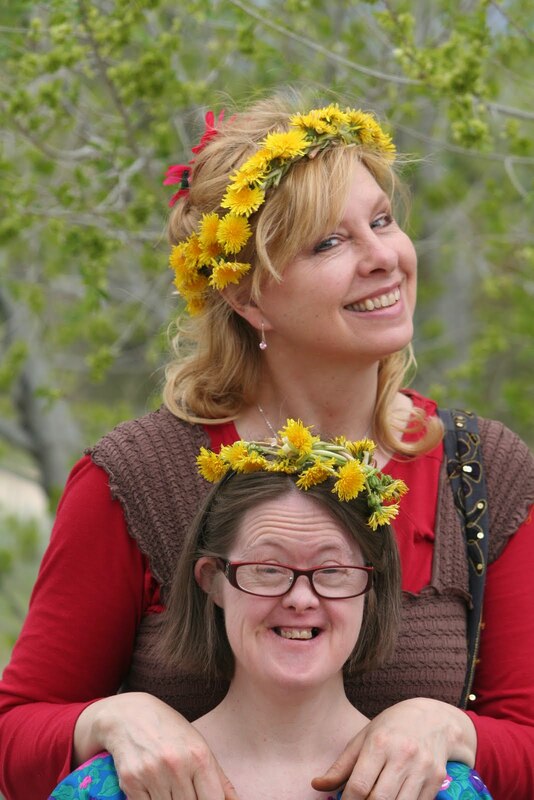 Just for you, here's a pix of my little sis and me modeling our new dandelion crowns. What things do you still like to do from your high school days? So I was writing along, shooting for my daily word count in a dramatic scene where a woman had a terrible accident. A doctor approaches her, and in that heartfelt moment of horror and compassion, he thought he could pick out her nose. It's not what I meant, not really! The good doctor could identify the structure of her nose from the surrounding mass of mangled flesh. But how wordy is that? Ah, how can writing be so alluring and yet so tortuous? How can I love it so? Why do you love the things you love? I received a message from talented new author CHERI CHESLEY that really can't be ignored if you have a heart beating in your chest. If her words doen't move you, then you'd better whip out your stethoscope and check to see if you're still alive. In part, Cheri's message reads "I hate feeling helpless...So I decided I’m going to help. And here is your opportunity to join in the fun." This can be a great chance for you. I can vouch for the fresh, exciting approach that Cheri takes to literature. We can't keep her book in our library doors. It keeps getting checked out. I admit, it was an impulse buy. I was actually at the store for marinara sauce to get my youngest son to eat my homemade cheese sticks. (They're cheaper than the take-out Italian food he begs me for, but he thinks they're not as good. Hah!) That's when I saw bright beets beaming at me from the label on a can. I reached up and grabbed some. The teenage checker at the till rolled a beet can over the scanner, paused, glanced at the label and asked, "What do you do with beets?" Was this a trick question? Cautiously I answered, "Eat them." The girl's eyes widened in surprise. "Really?" What planet was this girl from? "You've never had a beet?" I asked, waiting to see if she darted out a forked tongue. "No," she answered. Then her face grew thoughtful. "I think my mom tried to make me eat one once, but I wouldn't because I thought it would stain my teeth red." Well, alrighty then. All the more for me. Is there a food that you get sudden cravings for? For exercise, I dig dandelions. This is a reversal from my teenage years when I delighted in weaving the bright yellow blossoms into crowns to wear to school. (Yes, I did.) But experience changes Points of View. I would rather have grass in my yard that screaming yellow flowers that all too soon grow gray and war-like, shooting out their missiles of grass-killing destruction. So I go out every day and dig up the fiends disguised behind cheery yellow faces. It sometimes seems never-ending, but it's like writing a book. If I keep at it, word after word, dandelion after dandelion, eventually it will get done. Until the neighbors' evil dandelion seeds attack from over the fence...just like the next book that's screaming to be written. What kind of work do you feel will never be done? Since I would be gone two days at a book selling convention, I thought, "Why not work on writing while I sit at the table?" So I slid several folders of working book ideas, PLUS my big fat folder of random collected story ideas in a canvas bag and left home with high hopes. I returned without the bag. It took me years to write and file those story ideas. I felt like I'd lost a limb. Yeah, it hurt that bad. But then... oh joy! It struck me that Father in Heaven loves me more than I love my own boys... that is SCARY MUCH! So much, it could smother a person. With that much love, Father in Heaven would never hurt me, only help. So what if all those story ideas were, dare I say, junk? He obviously has better ideas to shower down on my brain? I'm open for new ideas, and they're a comin'. I've actually started two new folders to hold them all. How have you dealt with a numbing blow to your life?